Inside the Sete Cidades there are two lagoas: Lagoa Azul (blue lagoon) - the largest - and Lagoa Verde (green lagoon). Along the Lagoa Azul you'll find the village of Sete Cidades. Because these lakes are situated inside a crater, all the water in the area floods into the lake, which caused so frequent flooding of the village that in the 1930's it was decided to dig a tunnel to relieve the village from excess water. 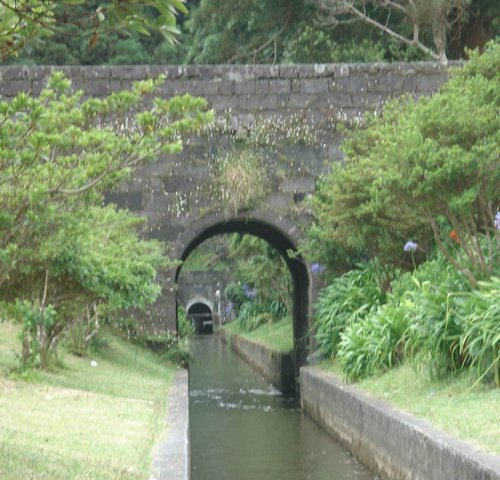 The tunnel has a length of 1200 m. and the water is chanelled through it by means of a levada which leaves sufficient walkingspace- also in height! Luckyly the constructors added a small sign on the wall every 10 meters indicating the distance, which made it possible to hide a cache inside the tunnel! The path has some wet places of (at our time in the end of August) 1-2 cm. water => no rubber boots or so necessary. The tunnel is directed west towards Mosteiros on the westcoast (please see aditional waypoint). The cache is hidden 356 number. from the Sete Cidades entrance and thus 605 m. from the Mosteiros entrance ! !! YOU WILL NEED A TORCH/FLASHLIGHT !! Please bring your own pen, too. I want to thank (RedRocks) for allowing me to use the coordinates and text from the original cache (now archived). Please remember : "Cache in, Trash out!"